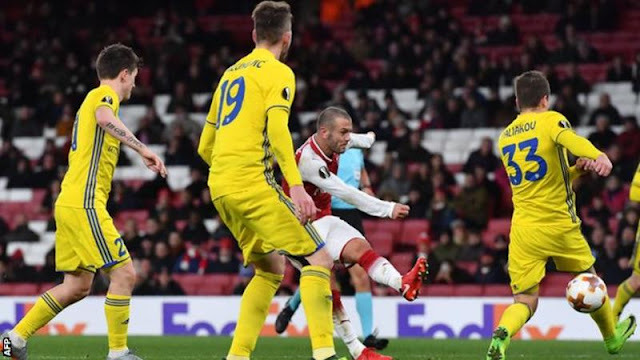 Jack Wilshere scored his first goal since May 2015 as Arsenal wrapped up their Europa League Group H campaign with a comfortable win over Bate Borisov. The Gunners had already secured top spot in the penultimate round of matches and went ahead with an angled finish from defender Mathieu Debuchy. Theo Walcott added Arsenal’s second when the forward finished from close-range after Danny Welbeck’s heavy touch. Midfielder Wilshere then scored a fine goal after he cut on to his left foot inside the penalty area and arrowed the ball into the net. Bate defender Denis Polyakov put Walcott’s low cross into his own net after half-time before striker Olivier Giround converted from the penalty spot following Nemanja Milunovic’s trip on Walcott. Mohamed Elneny added a sixth with a curling effort after being set up by Wilshere. In the wake of Arsenal’s 3-1 home defeat to Manchester United, this fixture represented a chance for some of Arsenal’s fringe players to impress. Manager Arsene Wenger made 11 changes from the side that lost to United in the Premier League, although the starting line-up still boasted plenty of experience. Bate had a chance of qualifying for the knockout phase of the competition but did not present much of a test for the Gunners who did not have to exert themselves to secure a routine victory. In truth the margin of victory probably should have been even greater given Arsenal managed 22 shots on goal. JAMB Uncovers Another N83m Fraud In Edo, Kano, Kogi Gombe And Plateau States.